Stevens, Jenkins and Sumpter bust a move at a recent City Winery show. Reid is in the background. Photo by Kelsey Mindham. Most “cover bands” are nothing more than mega-fans of the bands they adore, though with limited musical ability and ambition. “She’s Crafty” is different from those wannabes however– this all-female group brings a unique twist to The Beastie Boys, proving that there is no shame in their game. The group features Amy Sumpter, aka MCAmy in the role of Adam “MCA” Yauch; Kendra Stevens spitting Mike D Diamond’s rhymes as “Ken D;” and Maggie Jenkins doing Ad Rock’s lines as “Mag Rock;” along with Erica Reid, aka DJ ENRG. Just as humor was one of the first defining attributes of the Beastie Boys, comedy was the initial connection between Sumpter, Stevens and Jenkins. Sumpter and Stevens met through a mutual comedian friend; Sumpter met Jenkins at the Feminine Comique Class founded by late night standup Cameron Esposito; and Jenkins and Stevens met at The Kates comedy show at The Book Cellar in Lincoln Square. Reid joined the group later after first seeing them perform as a fan. The women, who are all professional comics, may be funny for most of their day, but when it comes to performing as “She’s Crafty,” they are all business. “We are funny ladies, but (She’s Crafty is) not a joke,” Sumpter said in a recent interview before a 22-song set at City Winery. 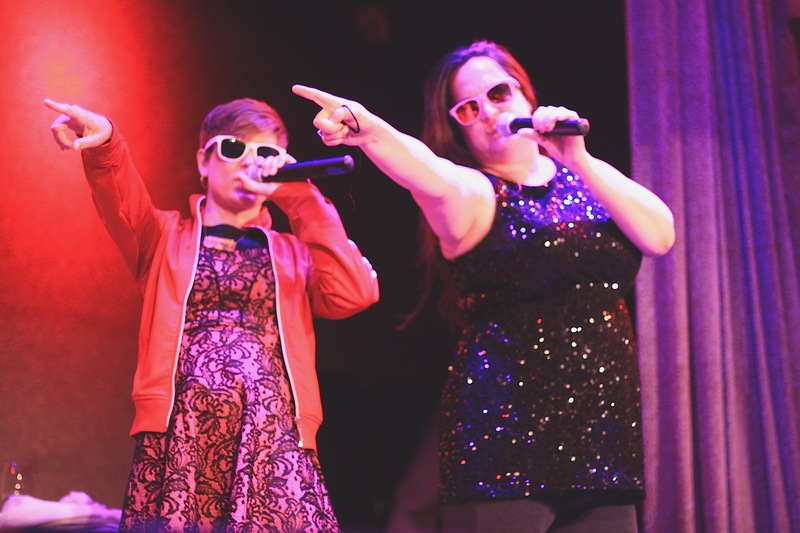 The fact that the women were performing at City Winery, and have performed at Double Door (home to some of the city’s most finicky music fans) attests to their ability to not only draw a crowd, but to perform the Beastie’s songs with skill and respect. Having grown up with the Beastie Boys’ music (all are in their 30s), the women discovered their mutual love of the New York trio when one of the group’s songs started playing in a bar they happened to be patronizing together in 2012. One of their earliest performances was largely in front of a crowd largely comprised of friends at Cafe Balou on Western Avenue in Ukrainian Village, not long after Yauch passed away in May 2012, where they performed a few Beastie songs karaoke style over laptop speakers. “We were in the back of a coffee shop with a laptop that you press play on, no speakers, just the laptop speakers. There were 30-40 people there,” Sumpter said. A few months later they had a gig at The Mutiny, performing about six songs, and after seeing the response, they decided to keep performing. “I swear we met 400 times that summer,” Jenkins said. 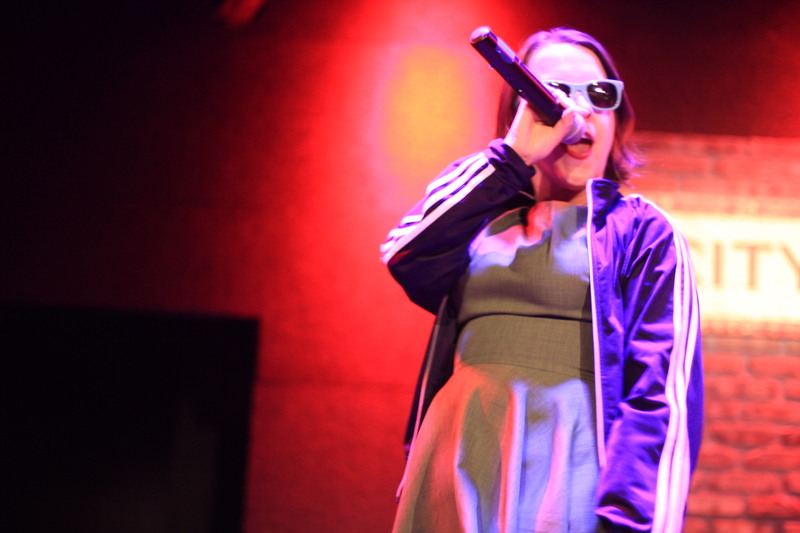 She’s Crafty now performs songs from every Beastie Boys album. “We don’t do the songs where they play instruments but haven’t ruled it out, and may work with a band eventually,” Jenkins said. As for practicing, She’s Crafty has about 25 Beastie Boy songs down and doesn’t need to meet together to rehearse like when they first started, Jenkins said. Jenkins explained the group progressed from starting with the hits to learning more of the trio’s complicated songs with overlapping lyrics. “When we started out, we really wanted to do at least one song from each of their major studio releases. Once we hit that goal, we started going through and picking out the biggest hits and of course, our favorites, and it grew from there. At first, some songs intimidated us because of their difficulty — the first time we ran through ‘Shadrach’ was a disaster — but now we’ve tackled a few of those beasts, so none of the songs really intimidate us anymore. The longer we’ve been doing this, the easier it has been to get songs performance ready, even though many of the songs are actually more difficult lyrically, especially the way the Beasties constantly overlap each other in songs like ‘Super Disco Breakin’ or ‘Shadrach.’ If we all practice on our own, we can get a song ready for a listening audience after just a couple group rehearsals,” Jenkins said. The audience at their shows have been mostly people in their 20s and 30s, according to Sumpter. Erica Reid, who DJ’s for She’s Crafty and is known as DJ ENRG, came upon She’s Crafty as a fan before joining the group. When the group first started they would don Adidas Track suits, but slowly have shed the garb because of two reasons. “Every time we wore the track suits it felt like we were coming off like a parody. That’s not our intention at all,” Sumpter explained. Jenkins added that they were extremely hot and now the group only wears the jackets when they walk onstage. As for those who wish they could see the Beastie’s again along with those who were too young to see the Beasties, Stevens said one of their biggest thrills is keeping the music alive. The women recognize that some of the early Beastie Boy albums were misogynistic, but they point out that the Beastie Boys grew up and evolved, acknowledging their lyrical mistakes in interviews and in the lyrics of songs that came after their first couple albums. The women also changed a few of the lyrics – both to filter some of the early raunch and to reflect their own realities. However, the songs belong to the Beastie Boys — and is the reason why you won’t find a CD from She’s Crafty. Kendra Stevens cutting it up. Photo by Kelsey Mindham. Maggie Jenkins and Amy Sumpter laying it down. Photo by Kelsey Mindham. “We changed a lot of lyrics just like they did when they changed their game and renounced a lot of stuff,” Sumpter said, pointing out that She’s Crafty has made some people realize that the Beastie Boys did grow up and change. Jenkins said they would love it if one day Mike D and Ad-Rock strolled up from the back of the room. “Imagine if one day they show up in the crowd and are like ‘what up dudes'” Jenkins said. Sumpter quickly added — “after our show, otherwise I’d be too nervous.” She admitted that She’s Crafty might “cry real hard” if that were to ever happen. For now, She’s Crafty says they want to keep entertaining and bring the music to Beastie fans. She added that not being able to put out records lessens the pressure on them, unlike original bands. Jenkins said She’s Crafty also wants to make MCA Day huge in Chicago. MCA Day is now an annual event every May 4 in New York, Chicago and other cities honoring Yauch on the anniversary of his death by raising money to fight Cancer. Stevens summed up She’s Crafty’s mission by saying “our main goal is to have a good time, and put good out into the world. It’s not about us, it’s about celebrating the Beastie Boys. “Never underestimate the power of nostalgia,” Sumpter said. “A lot of people feel ownership, these are their memories. We are aware of that and we are very respectful of that,” Sumpter said. Erica Reid also works with Blewt productions on their many creative projects and is a co-producer of Drunk Monkeys.